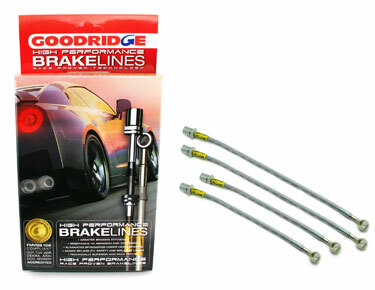 Goodridge G-Stop Brake Line kits are strongly recommended for any track driven car. The high pressures and temperatures are a bit much to ask of the stock rubber lines. However, the benefits of Goodridge G-Stop Brakelines are not only for track cars; they are also an excellent performance enhancement & safety improvement on the "daily driver". Goodridge G-Stop Brakelines are one of the most cost-effective safety improvements you can make to your vehicle to improve braking and reduce braking distances. Increases braking efficiency and eliminates spongy pedal under heavy braking. Combined with a properly maintained braking system, upgraded brake pads, rotors and brake fluid, braking distances are reduced increasing the margin of safety when you may need it. Goodridge race-bred brakelines are constructed from the finest quality hose, consisting of a ptfe inner and stainless steel overbraid. Always use fresh DOT approved brake fluid when replacing brakelines. Click here to view brake fluid options.